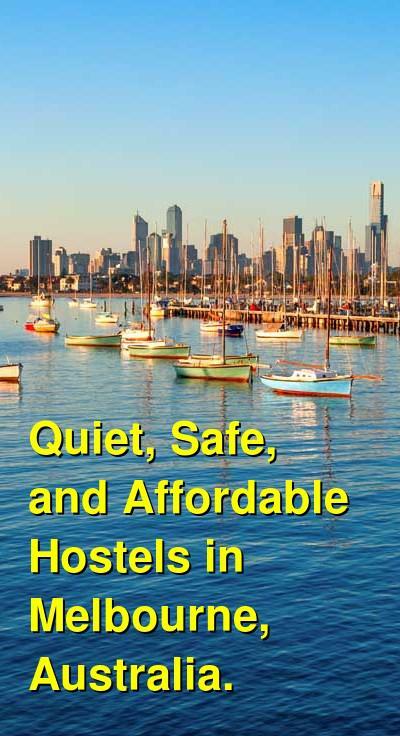 Quiet, Safe, and Affordable Hostels in Melbourne, Australia. Melbourne is considered the cultural capital of Australia. It has impressive museums, galleries, and theatres, and there's beautiful Victorian style architecture throughout. Many people also visit Melbourne because of its popular sporting events. It has the country's largest sporting arenas and is a popular destination for both domestic and international travelers. 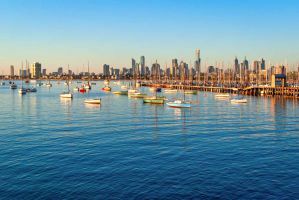 Visitors also use Melbourne as a base for exploring the surrounding areas such as the Grampians National Park, the Great Ocean Road, and Phillip Island. There are many great hostels in the city that offer affordable and comfortable places to stay. If you're looking for a relaxed and mellow setting where you can enjoy a good nights sleep, the hostels below are good options. How much do hostels in Melbourne cost? Victoria Hotel Backpackers is an affordable and comfortable hostel that is great for all types of travelers. It has thirty beds that are split between nine rooms. There are both private rooms and dorms to choose from. The private rooms are doubles and the dorms sleep four or six people. Both female only and mixed rooms are available. The hostel also has three common areas, a full kitchen where guests can prepare food, and a dining area. There's an outdoor balcony that is perfect if you want to enjoy the beautiful weather. This is a great hostel for backpackers who want to socialize and meet other guests, but also want to enjoy a good nights sleep. The staff are friendly and helpful, and the manager lives on-site. If you have any questions they are readily available to offer help. If you're looking for a hostel with a relaxed and mellow atmosphere where it's still easy to meet other guests, then this is a good option. Claremont Guesthouse is another top rated hostel in Melbourne. It is located in a charming old building that has a lot of character, and it's also in the fun area of South Yarra. There are 77 rooms in total that include private singles, twins, and doubles as well as four bed family rooms and six bed dorms. Dorms are split by gender. The hostel includes a variety of good amenities for guests. There's a free continental breakfast that is served every morning in the dining room. There's also free wi-fi available throughout the hostel. The staff are friendly and helpful and the facilities are kept clean. The hostel is conveniently located just 100 meters from the famous Chapel Street. It's also about a seven minute train ride from the central business district. If you're looking for a relaxed and comfortable place to stay that is a good value, then Claremont Guesthouse is a good option. Lords Lodge Backpackers is popular hostel in Melbourne. It's located in a 135 year old historical building that still has a lot of charm and character. The hostel is small and comfortable with a pleasant and relaxing atmosphere. It's a great option for budget travelers and backpackers who want an affordable, clean, and friendly place to stay. The hostel has a variety of amenities available to guests. There is wi-fi throughout the building, a shared kitchen that guests can use, a video lounge, free street parking for vehicles, personal lockers, luggage storage, and a nice garden area with barbecues. The staff also host weekly events and barbecues so you can meet other guests. Lords Lodge is located about a five minute walk from St. Kilda and a five minute tram ride from the city center. It's just a few minutes from Chapel St and Commerical Rd and it's near many great shops, bars, and restaurants. The hostel has single, double, and twin private rooms as well as four, six, and eight bed dorms. Female only dorms are available as well. A good hostel for couples and budget travellers. City Centre Budget Hotel is an affordable hotel option in the center of Melbourne. It has a variety of private room types available including doubles, twins, and singles. It's a small family run hotel that has a relaxed and welcoming atmosphere. The rooms are kept clean and there is a nice roof top garden. There are also laundry facilities and a shared kitchen available to guests. The hostel is conveniently located in Melbourne near many popular attractions including the MCG, tennis center, and Rod Laver Arena. It's in an area that is known for its theatres, shops, restaurants, bars, and clubs. It also offers easy access to Melbourne Airport. The staff here are respectful and helpful. They can help you with any travel arrangements or tours you might want to take. They can also answer any questions you might have about the surrounding area.